First published in April 1880, "Boule de Suif" is one of Guy de Maupassant's most famous and important short stories. The term "Boule de Suif" is most often translated to English as "Dumpling" but also sees the forms; "Butterball", "Ball of Lard", and "Ball of Fat." 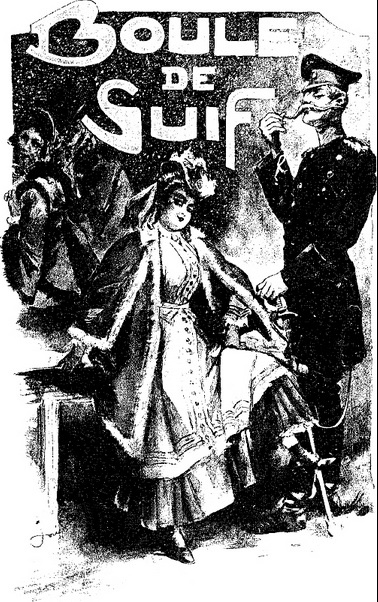 Boule de Suif is the plump female character pictured in the illustration below. The carriage is populated with a cross section of society, with Boule de Suif as a prostitute, representing the bottom rung. Please enjoy Maupassant's scathing criticism of the French society of his day. Add Boule de Suif to your own personal library.